I don’t have gum disease, do I? 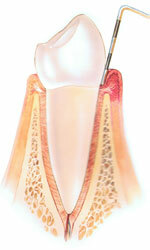 Most people don’t know they have periodontal (gum) disease until their dentist brings it to their attention. One of the reasons it comes as a surprise is that periodontal disease (also known as periodontitis, gum disease, or pyorrhea) is a silent disease, with few obvious symptoms in its early stages. 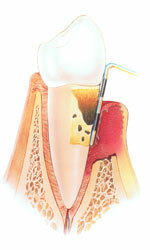 Periodontitis is a chronic disease. It takes a long time to develop and can be characterized by short periods of rapid tissue breakdown, followed by long periods of quiescence. With treatment, a periodontal condition can be controlled and maintained. Pockets: Pockets occur when the collar of gum becomes infected and detaches from the tooth - creating a space. This space is a "pocket." A pocket is not necessarily formed when food gets stuck between teeth. Bleeding: In spite of its common occurrence, gums are not supposed to bleed any more than fingers, ears, or noses do on their own. If any of those start hemorrhaging, everyone knows to stop the bleeding, and look into it if it recurs. But when gums continue to bleed, many simply ignore it, as if it were "normal." Bleeding gums are not normal. When gums bleed, at the very least, a minor, reversible problem exists. Sometimes the bleeding is a sign that there are deeper problems, and without some kind of treatment, pockets and bone loss will continue to occur. Bone loss: Dental x-rays, taken at regular intervals, chronicle bone levels surrounding the teeth. Subtle changes can be seen, and when they are observed, they are definite markers that periodontal breakdown is occurring. Bone loss left untreated, progresses until teeth are compromised. 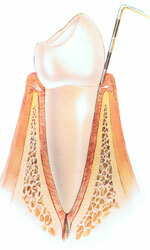 Fact: seventy percent of all teeth removed from adults is from bone loss due to periodontal disease…not decay. Loose teeth: Often early signs of loose teeth are detected by the dentist or hygienist, not by the person. Looseness in teeth is a sign that something is wrong. When discovered, the cause needs to be determined and corrected. Spaces forming between front teeth: In general, teeth don’t shift their position, though crowding of the lower (mandibular) front incisors does occur as we age. However, when spaces start forming between some of the upper (maxillary) front teeth, it’s time to figure out why. Sometimes, so many new dental restorations have been placed on the back teeth, that the front teeth shift. This happens. But the more common reason for front teeth to flare out is due to advanced bone loss and the lack of tooth support that comes with progressive periodontal disease. Once it occurs, it should be treated before it gets worse. Halitosis: Bad breath may be a sign that significant periodontal problems exist in someone’s mouth. Once the periodontal problems are under control, bad breath often goes away. 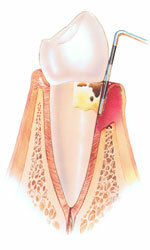 Abscess: Occasionally, the first time a person knows they have a gum problem is when they get a periodontal abscess. An abscess occurs when bacteria are trapped in a gum pocket. They have no way of escaping and the pocket expands, forming an abscess. If treated in time, little damage is done to the surrounding bone and tooth. Not treating an abscess in time, can lead to rapid and severe bone. When this happens, additional periodontal treatment is needed. Like all chronic diseases, periodontal disease doesn’t go away. It won’t get better by itself. It can remain silent and in remission, only to act up at a later date. As the condition worsens, it’s harder to successfully treat. That’s why once gum problems are noticed or diagnosed, it’s best to initiate treatment as soon as possible.